Water heaters are just as prone to developing issues over time as any other system in your home. Hopefully, you’re already scheduling consistent maintenance on an annual basis to keep your system as healthy as possible. Even if you are, though, the system could still develop problems between maintenance appointments. It’s important that you keep an eye out for any possible signs that your system is malfunctioning, so that you can call for repairs as soon as possible. 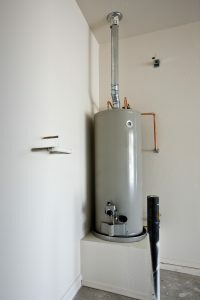 The following are some of the more common water heater issues you might run into, and their symptoms. Sediment from the water in your plumbing system can build up on the bottom of the water heater tank over time. This is especially common in geographic areas with hard water issues. The more sediment builds up in the tank, the more insulated the water in the tank becomes from the heat the system produces. If your water heater seems to be having trouble providing enough hot water, it’s possible that the tank needs to be flushed out to get rid of any sediment inside. The dip tube is a tube that runs from the water line to the bottom of the tank. It’s there to ensure that all freshwater stays closest to the heat source, and that it remains separate from the heated water leaving the top of the tank. The dip tube is only plastic, though. If it is cracked or broken, it will leak cold water into the hot water at the top of the tank. This will cause sudden temperature fluctuations at the faucet. Leaks are never a good sign, no matter how small they are or where in the system they occur. If you notice a leak in your water heater, you should always call for repairs as soon as you can. A leak in the wrong place could destroy your entire system if you’re not careful. Douglas Cooling & Heating offers water heater repair services in Jefferson County, AL. Contact us today for an appointment.